Maximise, a program offering space and promotional support for independent practitioners. After polling the public about their tastes in contemporary dance, Chunky Move are presenting the results in Wanted, a double-bill featuring Clear Pale Skin and Australia’s Most Wanted: Ballet for a contemporary democracy. Later this year, the company is touring to Sydney with the multi-media installation Closer, before heading off to Budapest and France. Commissioned earlier this year to create a piece for Graz Opera Ballet in Austria, Obarzanek took the opportunity to meet up with European choreographers including Alain Plaitel and Wim Vandekeybus. GO: Graz Opera Ballet was my first commission in 3 and a half years, and was both exciting and scary. After 3 years hard work in Melbourne, it seemed important to work with other people again. I was very happy with the work I did—it was an early version of Clear Pale Skin, and I came back and reworked it with my dancers. 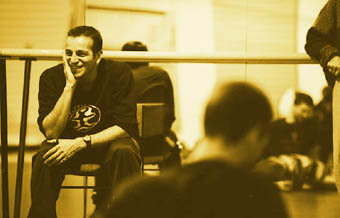 It’s good to travel but I have changed and need to work much more intensively, and with dancers who know the way I work. I don’t think you advance very far as a freelancer. But I did come back with enthusiasm and a lot more confidence, wanting to do more and do it better. How did Wanted fit in with the work you have been doing lately? In previous works [like Arcade], I have had an interest in the relationship with the audience. Then I came across a book by 2 Russian visual artists, Vitaly Komar and Alexander Melamid, who in 1993 conducted a survey to find out the ‘most wanted’ painting. I thought the discussions in the book were really compelling in regard to how a vision could be arrived at through the mechanism of a democratic process. Then we had the federal election last year, which I found simply demoralising—the 2 major parties were following the polls very closely and not taking responsibility for important decision-making. I remembered this book, and thought it would be interesting to make a dance piece about how a work could come together from the results of what people most wanted to see. The work of Komar and Melamid arrived at a style of painting from a period that most suited the answers—a Romantic landscape from the 19th century. While my work does arrive at the ‘most wanted’ work, the piece is close to an hour and is mostly concerned with the report itself and an analysis of the result—it’s actually performed to a reading of the report. So in a sense it’s a documentary, and not about dance but (a report which is) read through dance. This, being a novelty or ‘gimmick’, is quite different to how you normally structure your pieces. It’s very different. The report directs the work, and it’s split into sub-sections such as choreographic structures and qualities of movement, music, costumes and sets. So it’s like a series of small chapters, and there is a process of reducing each element down to the highest preference and then adding all the elements together at the end. What was difficult was not to impose my own idiosyncrasies on the work. It really became group-choreographed through a series of tasks I set, so I didn’t have much input into the actual movements or expressions. It is interesting that you’ve arrived at this project given Chunky Move’s agenda to open up contemporary dance to new audiences—the idea of polling is almost the logical conclusion to that. And that definitely began with Arcade’s format, a series of 6 choreographers and directors in 6 shops, with the works going on simultaneously. The audience could make a decision about what they did/didn’t want to see and how long they would stay with works—which also made the works somewhat competitive. As an artist running a major, state-funded dance company, you are very exposed to discussions about performing arts on a federal and state level. It seems in Australia, particularly since the Nugent Report, many of our conversations about art have been about who makes it, how much it costs, is it getting to the right people, and is it what people really want. This work is a response to the language, time and emphasis that is placed on the economics of art. And it’s certainly not an answer but probably another question. It’s an extreme response, but it came quite naturally. You are constantly driven to make work that’s relevant to a large audience. What other things do you draw from? Last time I spoke to you, you mentioned film, music and cartoons. I’ve always had a curious nature. When I was younger people thought I was too distracted from being a dancer, whereas now it’s an advantage in regard to making work. But I must say I feel a bit less connected to pop culture—particularly TV. I think I made signature works earlier on—things that came naturally to me about how I was placed in the world. But I don’t want to tell those stories anymore, and I’ve become more interested in the medium itself. So my works have become a little more analytical; they’re not story or character-based but about the relations between performance and people. Regarding the themes of Clear Pale Skin, I recalled a conversation we had about the horrors of ballet school—is your past revisiting you in this work? The whole ballet environment is a strong influence in this piece. It revolves around an obsession that one woman has with another, believing this other woman is extraordinarily perfect and that she herself is not. These kinds of distortions are certainly drawn from my experience at a suburban ballet school and then the Australian Ballet School in Melbourne. Seeing how obsessive and fanatical dancers can be about their training, the perceptions of themselves and the people around them, and the competitive nature of it all. So in this work there is a lot of faux ballet going on which is used to set up the relationship between these 2 women. Did it ever become a problem having these dancers who are quite perfect and the piece becoming self-referential? No, not really. Luckily most of my cast, and particularly Fiona Cameron, take an interest in the idea of the grossly imperfect and work on all their insecurities, letting them fester and come forth. You certainly don’t get the impression they are perfect when they do that. And the piece is not really talking about imperfect people but their perceptions of themselves, so the dancers can be quite amazing and beautiful. The company has this great new studio—how has that changed things? We started here 7 weeks ago when it was still a hard hat area. This building houses Chunky Move, Australia’s Centre for Contemporary Arts [ACCA] and Playbox’s set-building workshop. We have 2 studios where previously we had one. Previously too, the conditions of rental from the Opera meant that if they had rehearsals they could kick us out. One of the studios is enormous, like an aircraft carrier, and the other is much smaller. We are clocking a lot of hours because we can stay here all night. It’s great to have a home. We’ve also noticed that our morning classes, which are open to professionals, have increased in attendance and this year we’re going to have a lot more showings. Lucy Guerin is showing her work here later in the year, which will be the first time the studios will be used for a season. And we have a program called Maximise where choreographers can have studio space, technical equipment and some marketing for independent projects. We do have these resources and we like to share them when we can. Working in other media—film, CD-ROM, installation—is an interest of yours. What have you got coming up in the future? I have an installation with Peter Hennessy, Darrin Verhagen and Cordelia Beresford called Closer. It’s a projection in a room, the opposite wall of which is padded with sensors. People coming in are encouraged to ram their bodies into the wall, which effects the film. It’s not cryptic either—people learn very quickly which part of the wall effects which part of the film so it becomes a tool, a game. We shot it on film but it actually uses video because all the information sits on a hard drive—but it does have a very rich filmic look. It focuses on a body and it is shot in close-up and extreme close-up. Working in a live context you assume that the body is viewed from head to toe, even in a small venue. The one thing that film or video has to offer, and which I like as a choreographer, is the close-up. Working with dancers in a studio you see a lot of interesting detail which disappears when you put it on stage—like tendons under the skin, and hand grips. One of the reasons I’m so attracted to the installation is the relation it has to moving bodies in the room, and the choreography emerging as people move around and ram the wall and make teams—that live aspect interests me most. Closer was commissioned by the Australian Centre for the Moving Image [ACMI] for its new building in Federation Square, but it’s not going to be open in time so we’re previewing it in antistatic at Performance Space in late September. See Jonathan Marshall’s review of Wanted.